Gray's Pottery plate decorated with an art deco flowerhead pattern. This Gray's charger measures approximately 27cm in diameter. It has been decorated with a vibrant blue base with large striking pink and purple flowerheads with vibrant green leaves finished with a gilt rim around the edge of the plate. 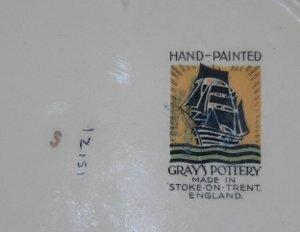 On the back of this plate is the Gray's Pottery, Hand-Painted Gray's Pottery Made In Stoke-On-Trent England, ship design pottery mark. It can be dated c1931-1961. Condition: Excellent overall condition. 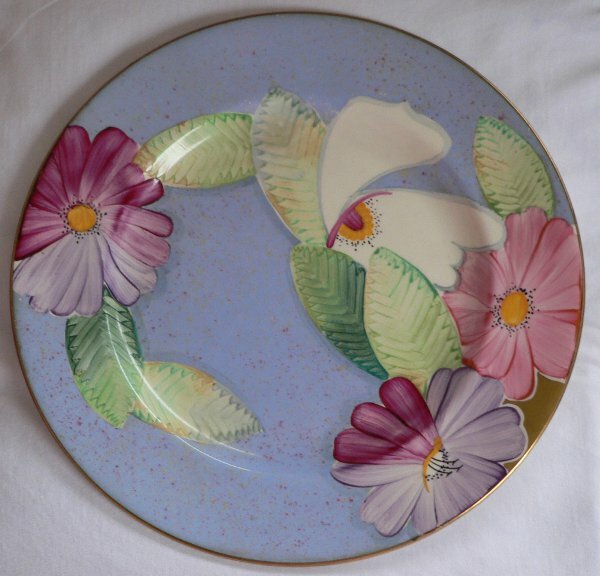 A very vibrant and Art Deco style Gray's plate.